Indie Lee is a New York based brand that I'd originally heard about a while ago on twitter. When I learned recently that abeautifulworld were bringing Indie Lee products to the UK I was excited to try out something from the range! The brand comes with an inspiring story - the founder and namesake of the brand Indie Lee found a passion to create eco-friendly, all natural beauty products after surviving a brain tumour. 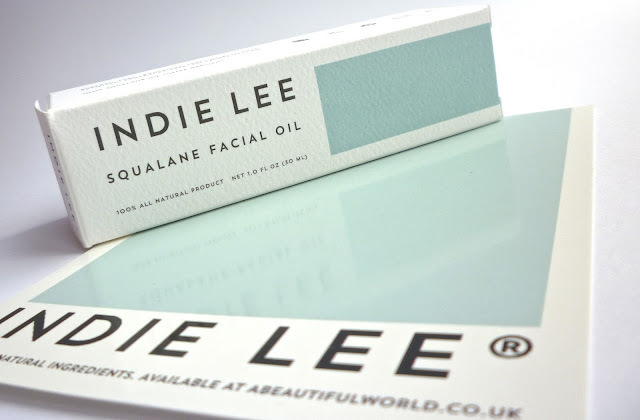 Indie Lee's product range uses the finest ingredients from around the world and has now developed into a full collection of eco-luxe skincare products, including cleansers, oils, serums and moisturisers. 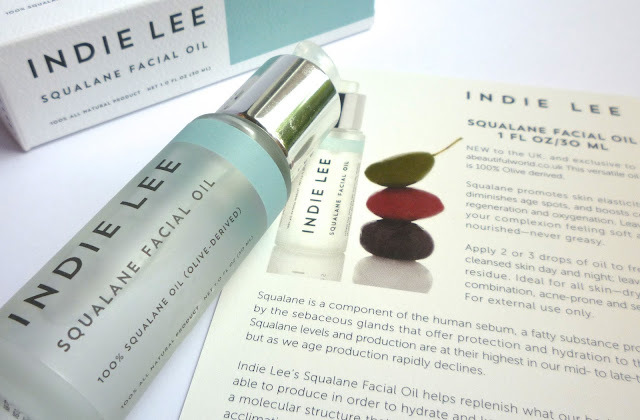 The Indie Lee Squalane Facial Oil* (£22.00) is one of the products that has just launched today at abeautifulworld. The only ingredient is simply 100% Squalane Oil derived from olives. Squalane keeps the skin looking young and is a naturally occurring component in our skin, produced by the sebaceous glands. I'm not quite there yet, but after your mid- to late-twenties, the level of Squalane production rapidly declines, so that's when you especially want to make sure you have Indie Lee's Squalane Oil to help out! Squalane promotes elasticity of the skin, boosts cell regeneration and diminishes age spots. The oil comes in a bottle with a pump to dispense it. At first I wasn't quite a fan of the pump as it was spurting out everywhere, but after a few tries I've learnt how to avoid that by just quickly pressing the pump once into the palm of your hand. Easy! The pump lid is also lockable which is perfect for taking it travelling to avoid any leaks. I have to say I'm totally loving this oil! Even though I'm at an age where my skin is probably producing a good amount of Squalane already, it can't hurt to top up the supply right?! The oil itself is completely odourless and you only need the smallest amount. It absorbs really easily as it resembles our skin's own molecular structure and it works wonderfully under makeup too. I've definitely noticed a difference since using this daily - it just makes my skin look a little fuller and smoother! If you're interested in trying some of the range, abeautifulworld are offering 20% off any Indie Lee purchases with the promo code INDIE20 until the 7th October, so be sure to take advantage of the discount while you can! Do you like the sound of Indie Lee's products?